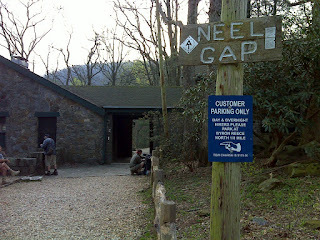 Headed to the Reece Memorial trailhead parking area at Neel or Neels Gap. 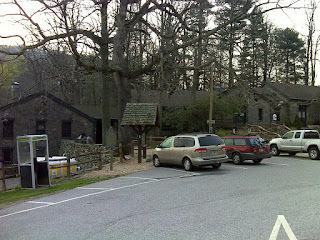 It took well over an hour to get there, so I wasn’t on the trail until 8:15AM. 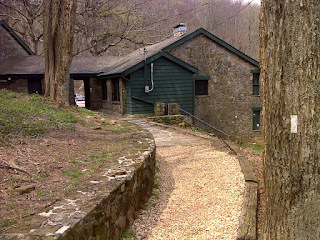 I hiked the nearly half mile back up to the AT crossing at the Walasi-Yi center. They were just opening their store, and a handful of hikers, perhaps up to a dozen, were hanging around and or getting ready to go. I lingered there taking photos for a bit before heading up the trail. The whole five mile section up to my turn-around at Cowrock Mountain was relatively easy, though with quite a few hills to go up and down. The way back had one steeper climb—it almost seems as if they’ve groomed the trail through Georgia to make it easier for the newbie northbounders, and let the southbounders have the tougher, less groomed climbs. 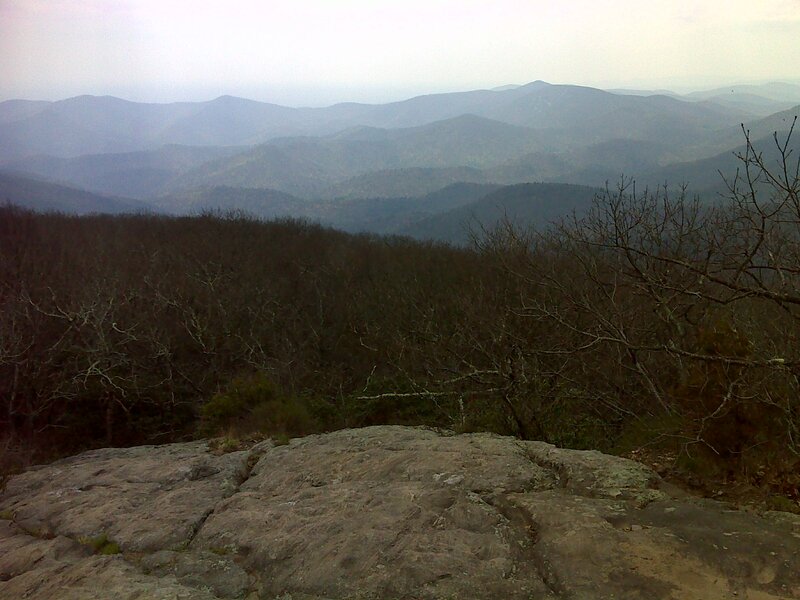 That was very much also true of the ascent of Blood Mountain, which entirely dominated the afternoon 5 mile leg. 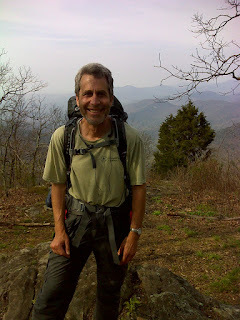 On the way north to Cowrock I struck up a conversation with a fit thru-hiker from CT named ‘Nomad’ who is 60 but looks 50 or less—a just-retired school teacher. He opened the conversation by asking about the little three-leaved ubiquitous flower that are abundant here and that I’ve been wondering about too. It blooms in two distinct colors – a dominant deep purple and a clear yellow: pure Mendelian genetics it appears based on the 75-25% ratio. (I later learned that it is a type of trillium called Toad Shade.) Nomad and I walked together and got each others’ stories and I took his photo on Cowrock and he took mine. The only other notable people meetings of the day was a set of identical twin young women I passed with their dogs – no conversation, just the oddity of twin thru-hikers. The hiker count was 83, though that could be off by a few if I missed people taking a midday break as I passed through Walasi-Yi. The weather was humid and there was enough haze to mar the views. There were views from Wolf Laurel Top and, of course, Cowrock in the morning and fantastic view opportunities from Blood Mountain. I took the obligatory photos, but the quality of the viewing wasn’t the best. The humidity did make for pleasant spring-like hiking, though, and the emergence of life and greenery is happening at an alarming rate. 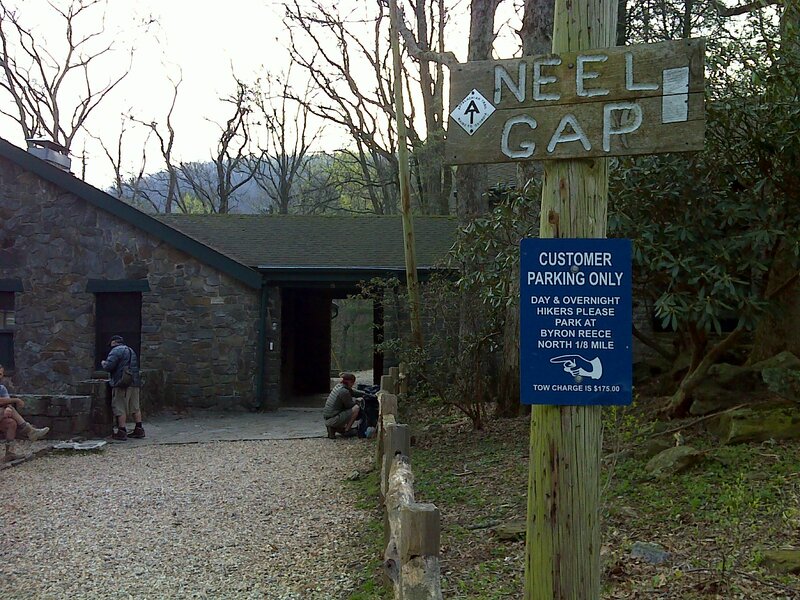 The end-of-day return ascent of Blood Mountain put me against my ‘wall’, so I actually had to stop to eat shortly after I began the final long descent to Neel’s Gap. It’s amazing how suddenly that ‘wall’ hits, how intense it is (every aspect of your body, including brain function, deteriorates noticeably) and how instantly the intake of food restores normalcy. I stopped in at the store at Walasi-Yi for the third time before returning to my van. I bought nothing. There was a commotion this evening down at a highway-turnout parking area in sight of the store - one that the sign says is supposed to be used only for emergencies. It seems a car full of genuine country types had stopped there. I’m guessing one of the (heavily bearded) men wanted to pee. 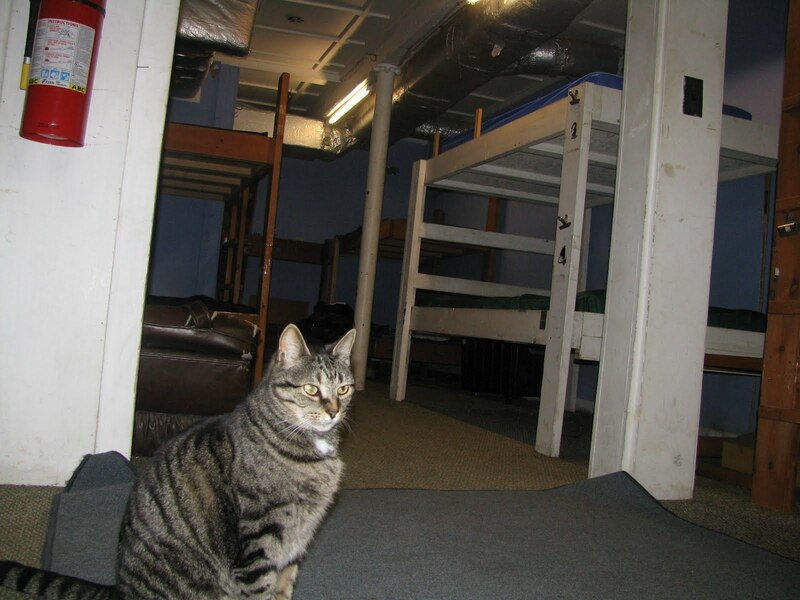 In any case he slipped at the edge of the precipice (overweight and out of shape it appears) and had a serious fall of 50 feet or so, rolling over rocks and breaking bones. 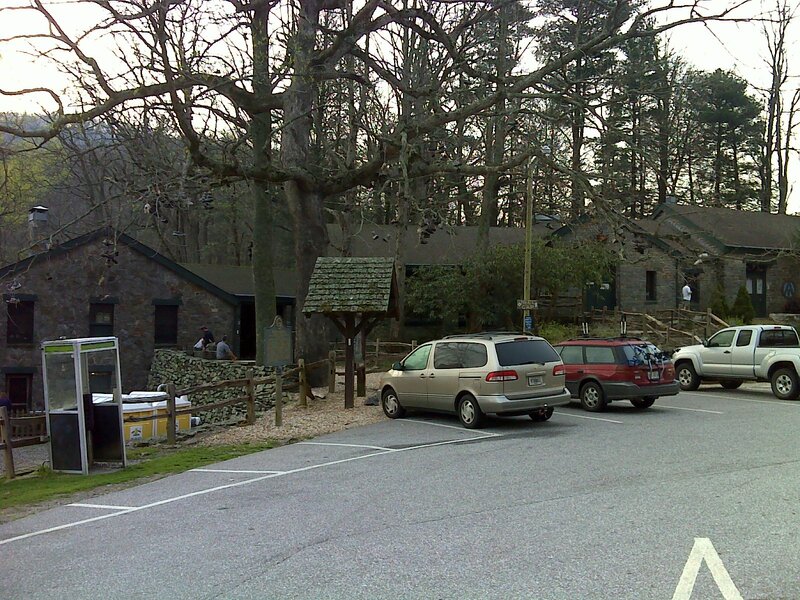 He was talking, they said, and an ambulance arrived shortly after I passed, walking down the highway to the trailhead parking area. I hope he's OK.